Today, I’d like to tell you the story of how my son fell in love. In June 2013, just a few short weeks after we arrived in the sleepy city of Basel, Stephen and I enrolled our son in a multi-lingual daycare facility just a few minutes drive from our home. Given our new surroundings, we wanted to make sure that Aidan got a head start on developing his new language and social skills. Aidan & Annabel met on his first day of “school”. Aidan was just a few weeks shy of turning one. Annabel had just celebrated her first birthday. Within months, the teachers were joking that Aidan and Annabel’s relationship had turned into a bit of a love story. They were now hugging. Holding hands. Taking care of one another as an elderly couple would. Two years later, these two continue to have an amazing relationship. Aidan’s German is shaky at best, as is Annabel’s English. Yet despite the communication barrier, the two have managed to create a language of their own. 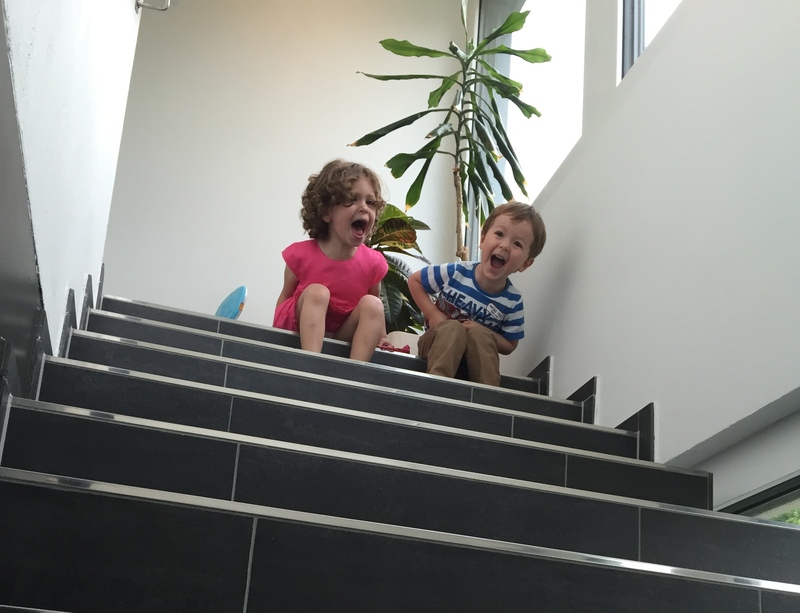 Every morning Aidan arrives at school, Annabel is waiting for him with his favourite auto. And every time I pick up Aidan from school, he gives Annabel, or “fun Bella” as he calls her, a hug goodbye. “Ich liebe Aidan,” Annabel now tells her mother. “Daddy, I love Bella,” Aidan proclaimed to his father this past weekend. Annabel’s mother and I joke that we aren’t sure whether to plan playdates or a wedding. For now, we are happy with letting these two enjoy the beauty of such a strong friendship. And of course, we are hoping that these two manage to maintain their friendship over the years. Especially since her mother and I happen to get along pretty darn well! This past weekend, Annabel turned three. 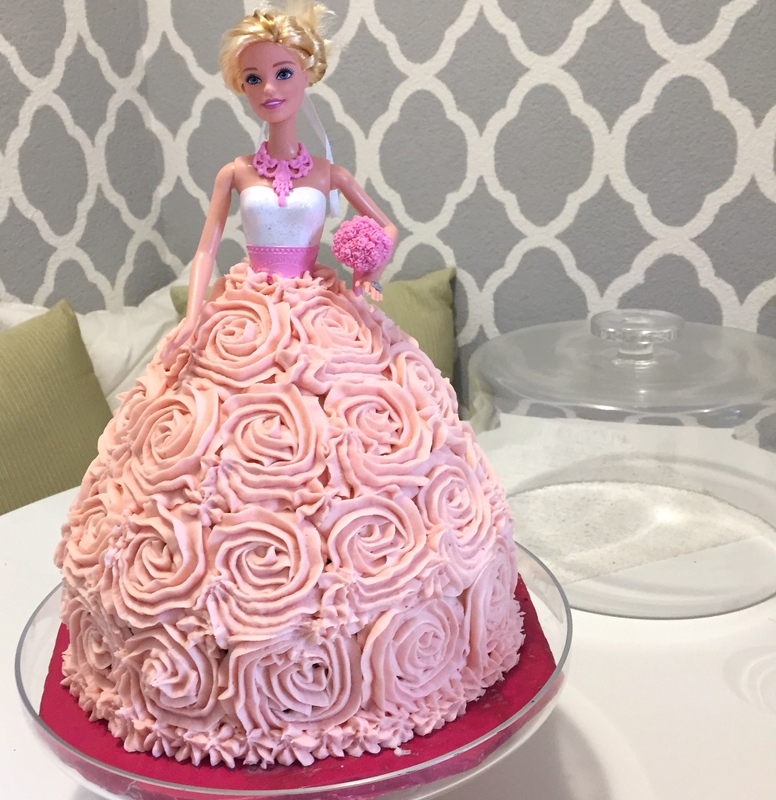 Her mother had put together a beautiful princess party theme, and I wanted to help. 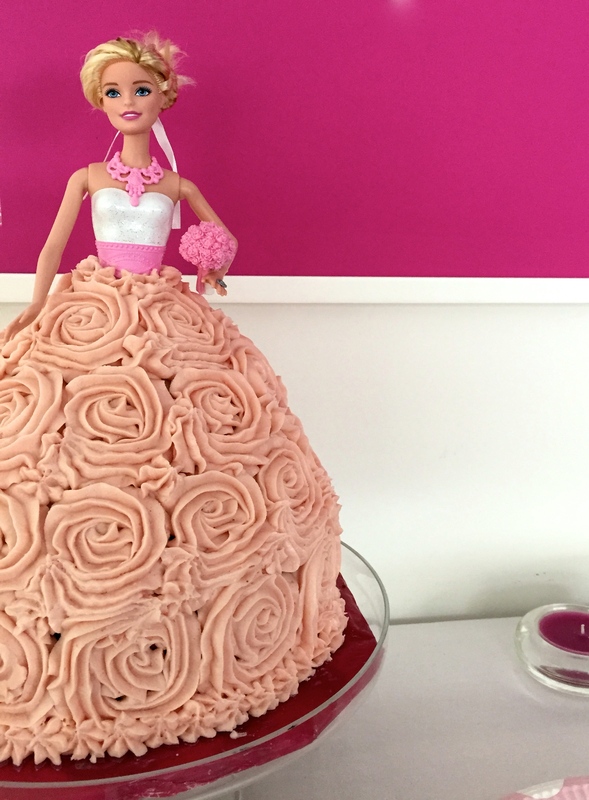 I had seen pictures of barbie cakes, and given that Aidan’s doll time involves grooming his many tractor toys, I realised I was limited in my overly girly projects. Thankfully, Annabel’s mother accepted my offer to bake the cake. The guidelines were simple. Pink. Pink. Pink. Youtube video after Youtube video, I studied how folks had put these together. It all seemed too easy. And I was right. It was. I used two baking tins. One round 9 inch (23 cm) tin, and one 2-liter oven-safe Pyrex bowl (pudding bowl). 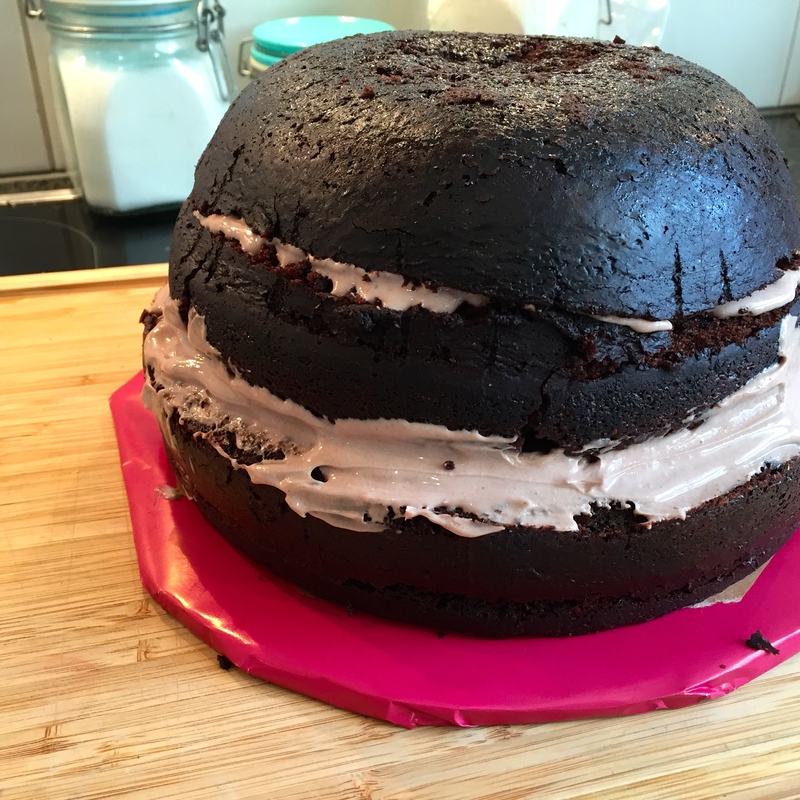 The bottom part of the cake was the round tin. The top part of the cake was the Pyrex bowl. 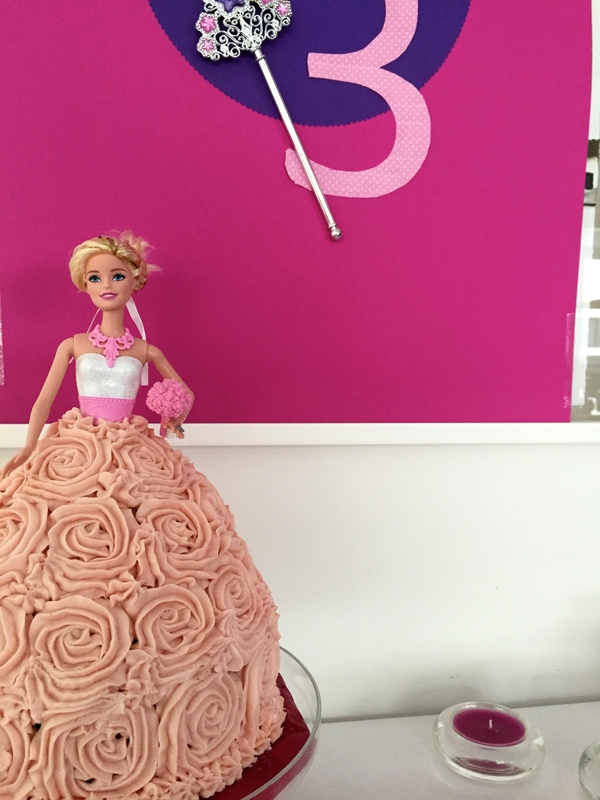 I knew ahead of time that my Barbie was going to be slightly taller than the cake. I had two options – I could either make a second layer using the round tin, or, because the round tin was slightly wider than the pyrex bowl (take a look at the picture above), I could very gently slice around the edges and redistribute it to the top. I chose option 2. If you only have the U.S. standard 8-inch tins, you won’t be able to cut around the cake. 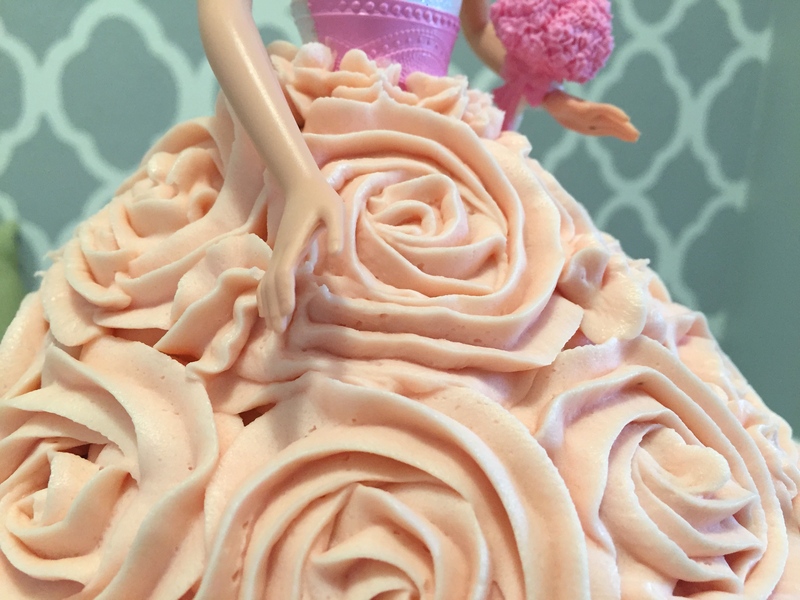 You can also chose to remove Barbie’s legs (ouch!) but if this is a present and you don’t want to destroy the toy, option 2 is simple. These pictures aren’t pretty. But beauty takes work, right? 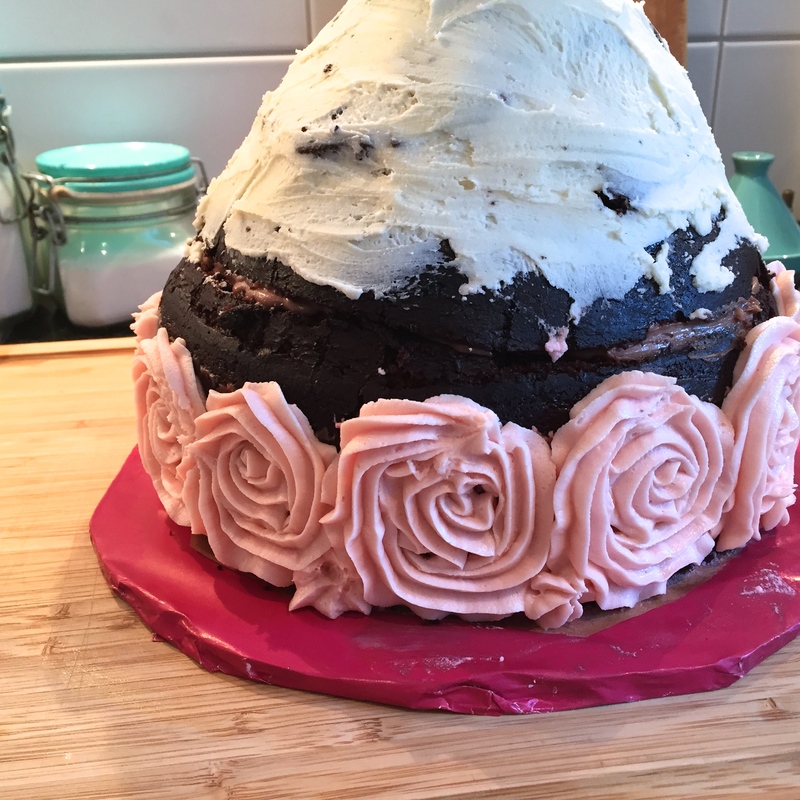 Once I had the shape complete, I stuck the cake in the freezer for a few minutes, then crumb frosted the edges that I thought were at risk of falling. I didn’t crumb frost the entire cake because I was a bit limited on frosting and wanted to make sure I had the entire cake covered. Shops in Switzerland are closed on Sundays, and as such, once I was out, I was out. So corners were cut. The key to getting the frosting on is to pop the cake in the freezer for 5-10 minutes to let it harden slightly. This makes it much easier to frost. Feel free to do this after each round (before and after the crumb frost and the main frost). 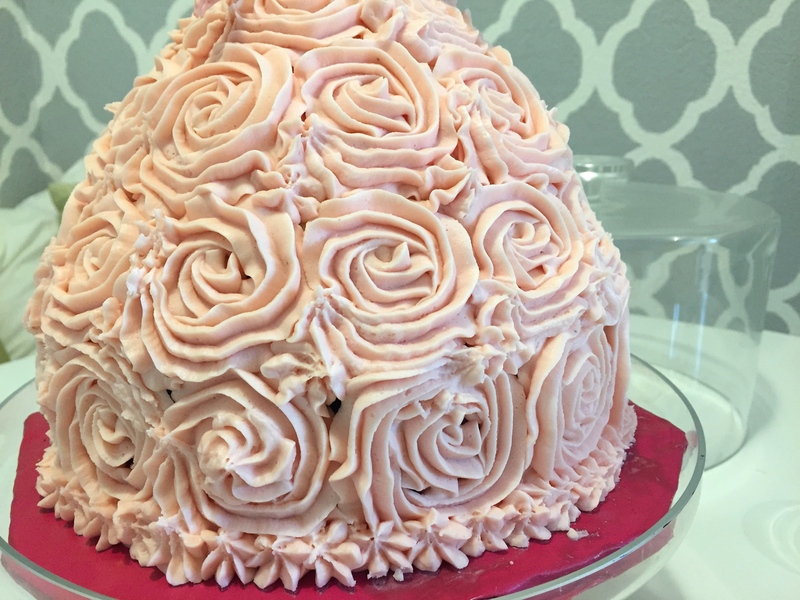 Once the crumb frosting was set, I only had to add the rose-shaped frosting. This is an incredibly easy swirl method that you use with a piping bag and a star-shaped piping tip. Start from the inside, then swirl around once in a steady motion. Rule of thumb: I was nervous when I first began, and so I started in the back. Always start in the back. Makes it much easier to have a few practice rounds (or even practice on wax paper first). Once I got the hang of it, the frosting was done in a matter of minutes. I added a few star-shaped inserts in between the roses to cover up some of the chocolate peaking out. And piped the bottom and the top of the dress to give it a bit of trim. Five minutes later, I was done. Barbie was ready for Fun Bella. 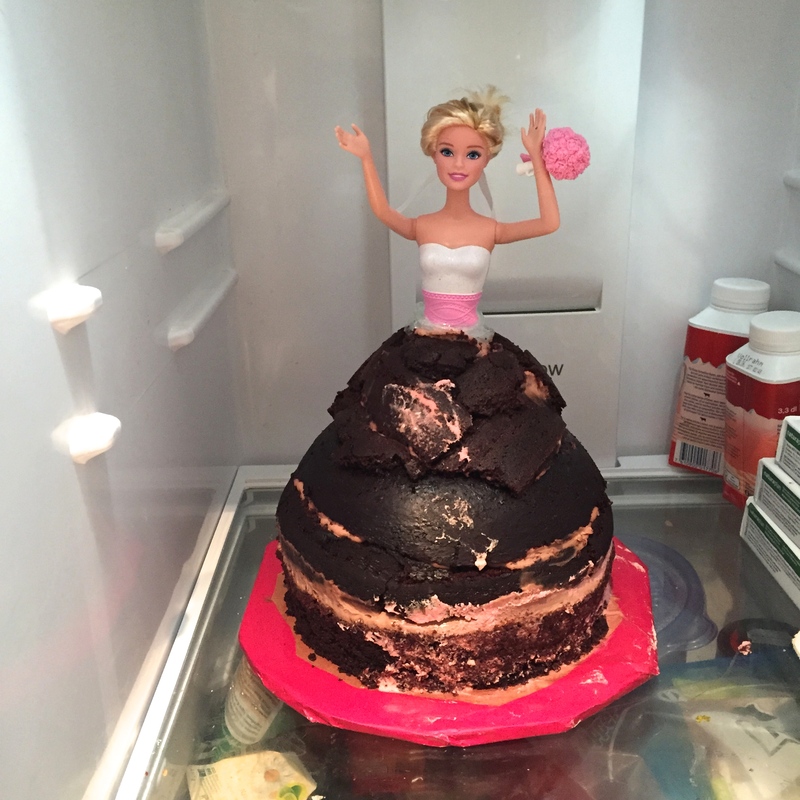 And I was relieved that my first attempt at the Barbie cake was not a massive fail. The day itself was fantastic. Minus some pretty severe meltdowns from my son over his inability to realise that presents are not just for him, everyone had a great time. But the best part of it for me was watching the kids’ eyes widen in delight at this cake. Annabel’s mother managed to capture this priceless picture. I haven’t been able to stop staring at it all week. It is expressions like these that make me realise how much I love my little world of crafts and creations. It’s so much fun. Making magic, that is. I loved every second of making this cake. In part because I adored Barbies as a child and this just brought me back to my days of cutting their hair and designing their clothes with my mother’s scrap fabric pieces. Sounds like the next big Hollywood hit starring Tom Hanks and Meg Ryan, right? I call dibs on playing the matchmaking mother-in-law to be. 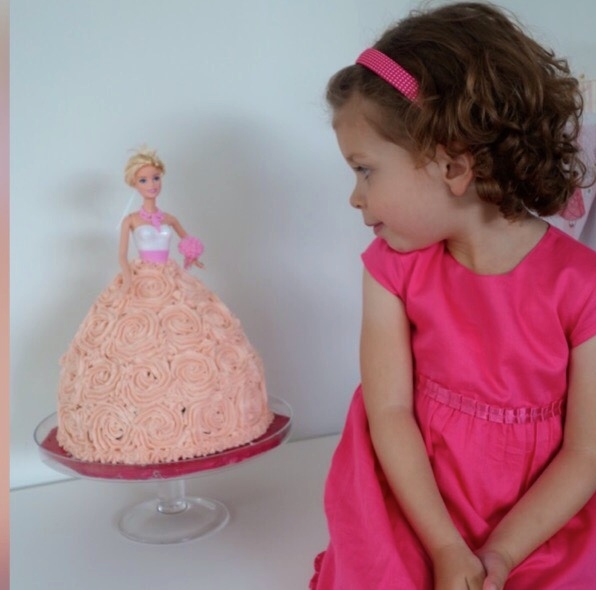 Dear Naomi, thank you so much for making Annabel’s birthday so special, what a sparkle in her eyes this was when she saw the cake for the first time just before her party began. And what a sparkle in Hein’s and my eyes just by watching our happy little girl! Thank you for the beautiful post on your blog, I think I read it 8 times already – it is for sure going to be one of my favorite blog posts, too! I will keep it and make sure Annabel can read when she gets older! You would think what do these 3 year old kids know about love … I am sure they know more than we think! Can’t wait to see how the story continues … THANK YOU!